The Gauteng ANC drew a huge crowd to their manifesto rally last Saturday. But it could not evoke enthusiasm. Usually when one is in a large crowd there is a buzz of excitement. Ten or 20 years ago, if a freedom song was sung, it would emerge from the crowd or, if from the stage, be taken up by supporters all over the stadium. That did not happen. The ANC of today exists, but it is dying. The ANC of today exists, but it is dying, not in the sense that it will be no more in the near future, but in that it no longer exists as an organisation that evokes the powerful imagery of freedom and self-empowerment. It now symbolises graft and violence. By RAYMOND SUTTNER. The Gauteng ANC almost fulfilled their promise that they would fill the 95,000-seater FNB stadium for the provincial launch of their local government election manifesto last Saturday. There were some empty seats and people did leave during President Jacob Zuma’s speech, but they pulled about 20,000 to 40,000 more than there have been at any other rally. There does not seem to have been anything untoward in the way this was achieved. It was an organisational feat that the experienced Gauteng leadership was able to ensure happened in a way that is not possible in most other provinces. The Gauteng leadership at provincial and other levels have been working together for some time. Many of them joined the struggle in the difficult times and the Gauteng Chair, Paul Mashatile, spent every day of all the States of Emergency of the 1980s in detention. He launched the Alexandra Youth Congress in 1983 and was its first president. He was one of the secretaries of the then Transvaal UDF. He had been an underground operative and worked with Vincent Tshabalala, the MK martyr who died fighting the security forces on his own, street by street, in Alex. The FNB stadium management confirms the claimed number of 87,000, but nevertheless there was something lacking in the rally. There was little enthusiasm. Usually when one is in a large crowd there is a buzz of excitement. Ten or 20 years ago, if a freedom song was sung, it would emerge from the crowd or, if from the stage, it would be taken up by supporters all over the stadium. Who among those who was there can forget the SACP launch as a legal organisation in 1990, when Chris Hani spoke and danced and the stands shook as the crowd danced with him? But much of the crowd did not join in, certainly not with the fervour that would have been the case in the past. They were not involved in what emanated from the leadership on the stage. In contrast, the EFF rally of a month ago packed the smaller Orlando stadium to the brim with over 40,000 people and was gripped with excitement. What one had not seen for a long time was that people did not simply file off at the end or before the end as in the ANC rally. Many stayed behind and made their way to the stage where the leadership were. They did not want to leave. They did not want to go home. They savoured the excitement of the moment. Whether or not the EFF is populist or can have a range of other labels attached to it, the reality is that it has captured many people’s imagination. EFF supporters were tweeting and acting on a range of social media and celebrating in other ways for some time after this. That excitement no longer attaches to the ANC, as its members engage in violence and killings to secure places on election lists. Gone are the days when what battles there were related to ideas or to political direction. The Auditor-General has presented astonishing figures of monies that are unaccounted for and huge amounts spent on consultants in local government. The employment of consultants has in some cases produced worse results than before. In truth, local government, as with higher levels from where the force of example seeps downwards, is a site of graft and the consultants may well be colluding in and benefitting from contracts and tenders. The ANC may still hold onto all its municipalities and win more or less the same voting support it enjoyed in 2014. Who knows? But what is clear is that the ANC is not alive and well. There is erosion and corrosion of what inspired many to pin their hopes on and dedicate their lives to the organisation. There was a time when some would be dissatisfied not to be elected to this or that position in the past, but that would be because the person who defeated him or her represented a political standpoint that the defeated candidate regarded as problematic. It had nothing to do with money. Certainly there were some spoils in the pre-liberation period. There was a time when some would be selected from among MK soldiers or other cadres for specialised training and others were not. Some were able to pursue their studies in more prestigious places than others due to connections. Whatever the weaknesses of the ANC in exile, it became more and more attuned to what was happening inside the country. The current demonisation of the ANC in exile is erasing an important part of liberation history. Very many who were in the struggle, inside the country, listened to and learnt from the ANC’s Radio Freedom broadcasts. Who in the struggle inside the country can forget the guidelines of the ANC January 8 anniversary statements? Whatever the weaknesses and irregularities, the ANC in exile managed to provide political guidance that was in line with what people could do inside the country. It became more and more aware of what confronted people and their organisational resources in the various parts of the country. Thus, in the “Year of the Youth”, the injunction to form youth organisations was followed by the rise of hundreds of these. The “Year of the Women” not only advanced a more feminist direction, but also inspired the formation of a significant number of women’s organisations all over the country. The 1986 call to make South Africa “ungovernable” and apartheid “unworkable” was based on a measured assessment of what was possible, and it was realised in practice. Oliver Tambo’s speech encouraging this development was listened to over and over again on cassettes tapes that circulated illegally. Likewise, the realisation that it was undesirable to have ungovernability as a permanent condition was followed by the call to establish “elementary organs of people’s power”. It was implemented in many areas, sometimes with accompanying abuse. This was especially so when mature guidance was lost because older comrades were arrested. But some important developments did emerge in this period and need to be revisited when we rebuild our democratic order. 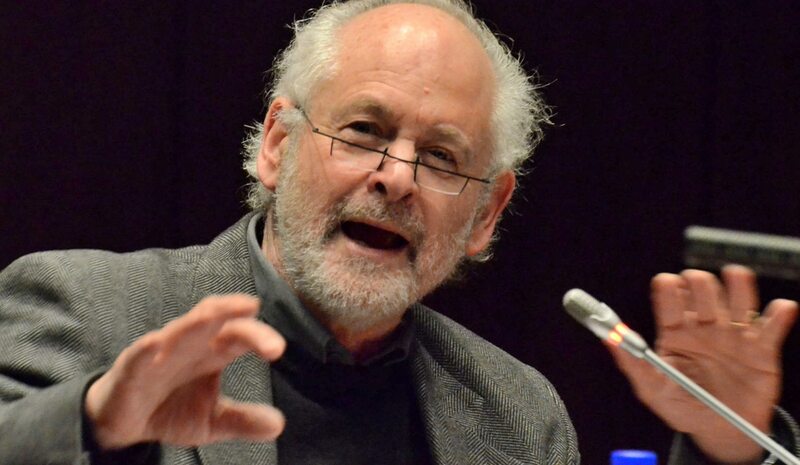 Photo of Raymond Suttner by Ivor Markman.